Just like you would lose text messages (SMS) from iPhone, there are big chances that you deleted Whatsapp on iPhone in error or lost your WhatsApp messages for other reasons. Luckily, you can recover WhatsApp messages from iPhone even though you deleted them by accident, restore iPhone to factory settings, jailbreak, update to iOS 10.3/9/8.x, get iPhone damaged, etc. Retrieving iPhone WhatsApp messages is very easy with WhatsApp Recovery, which is the excellent and professional WhatAapp recovery software to help you restore WhatsApp messages from iPhone models. It provides 2 ways: recover WhatsApp messages directly from iPhone without backup, extract WhatsApp messages from iPhone backup. It works to recover WhatsApp call history on iPhone 5, 4, 5c, 5s, 6, 6 Plus, 6S, SE. Have a free download and trial. If you have no iTunes or iCloud backup for your iPhone WhatsApp messages, you can easily extract and recover deleted WhatsApp messages from iPhone without backup using WhatApp Chat Recovery. 2. You can preview all the conversations. 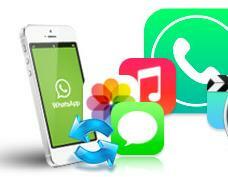 Select your wanted WhatsApp messages and click on "Export" to start iPhone WhatsApp message recovery. Then select a save path to save the extracted files. Backing up iPhone is the safest way to avoid data loss. 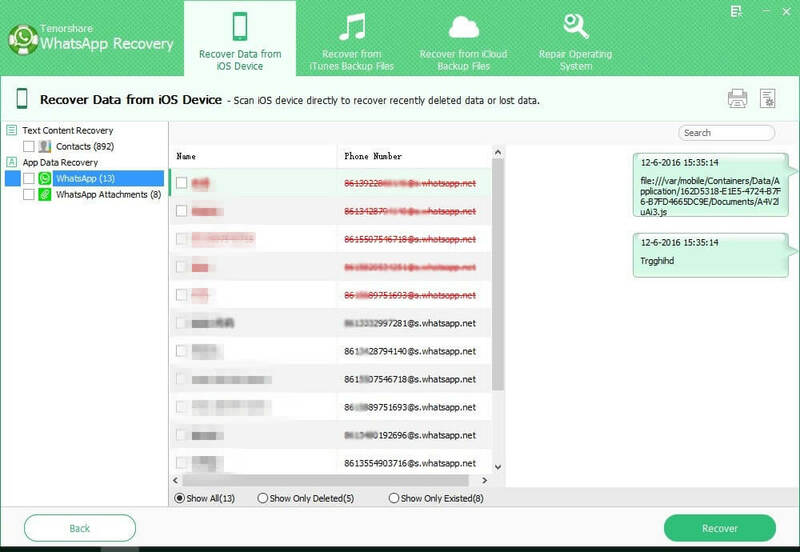 If you have backed up iPhone data with iTunes, you can use WhatsApp message recovery to recover iPhone WhatsApp chat history from iTunes backup. This is very useful since iTunes backs up iPhone messages and other data into unreadable database and files. 1. Run WhatsApp Recovery. All iTunes backup files will show up. Select your iPhone backup file in the backup option. The program will display your WhatsApp messages, photos, videos audios. 2. Preview all your deleted or lost WhatsApp chats and select those you think are important to restore. You can also click on "Contacts" to get back WhatsApp contacts from iPhone 6. WhatsApp recovery software has received lots of good reviews from iOS users since it is powerful to retrieve WhatsApp messages from iPhone. If you want to extract WhatsApp messages for free, try the free WhatsApp recovery. If you are using macOS 10.12 Sierra, Mac OS X 10.10 Yosemite, 10.9 Mavericks, 10.8 Mountain Lion, 10.7, 10.6, go to WhatsApp Recovery for Mac to recover deleted, lost iPhone WhatsApp messages on Mac. WhatsApp Messenger is a smartphone messenger available for iPhone and other phones. It allows you to receive and send messages, pictures, audio notes and videos messages by using 3G or Wi-Fi. You can download WhatsApp from iTunes. There are some cases that when you update WhatsApp to the newest version, the app itself becomes crashed and you have to delete it. Thus you would lose all WhatsApp chat history and need to restore deleted WhatsApp. If you are in this case, or lost the past conversations due to the reasons mentioned above, read on to recover iPhone WhatsApp messages.